Keeping current with Apple’s iOS updates is a never ending task. Just when we started to get a hang of the changes brought on by iOS4, Apple released iOS5. Of course, not all of the updates and new features are of direct concern to everyone. Still, knowing about them is important and sometimes helpful, especially if the changes make life easier for the developer. O’Reilly is the go-to publisher for books related to software programming. We have a pretty decent collection in our library. 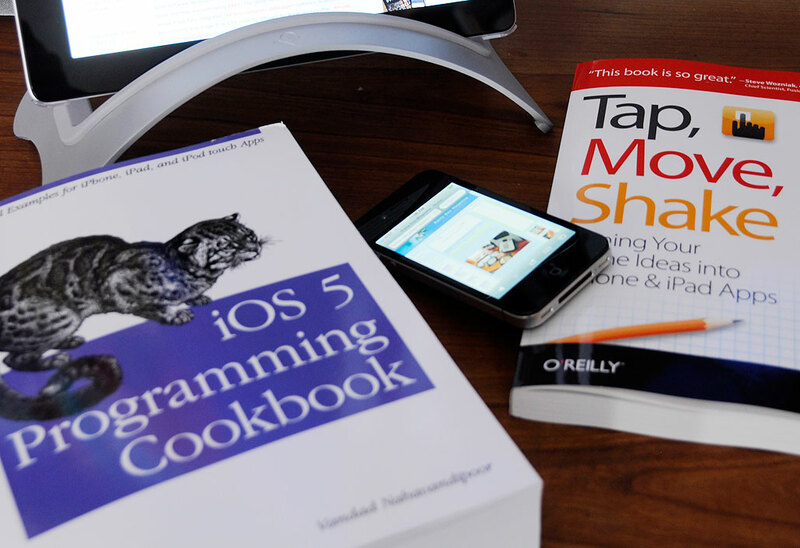 Two recent additions are iOS 5 Programming Cookbook by Vandad Nahavandipoor and Tap, Move, Shake by Todd Moore. Many of us have had flashes of ideas and thought, “Hey, that could make for a cool game!” However, game-programming is not about just writing a few functions, adding some pretty graphics, slapping on a cool name, and calling it a day. It is an entire engineering discipline onto itself. An engaging game can transport a player into a self-contained world. To do that effectively, the developer must understand more than just how to write code. Depending on the game, the creator may have to be a storyteller, an artist, or even a physicist. Sometimes it helps to be all three! In Tap, Move, Shake the author walks the reader thought the entire process of developing an iPhone-based air hockey game. The book is NOT an introduction to programming, but an excellent tutorial for someone interested in seeing the game-development process from start (getting a developer account) through development(creating the UI, debugging the code) to finish (submitting the final app to the Apple for approval). Along the way, the reader will see how the author evolved the original idea, iterated and refined the implementation, and finally polished the edges. The readers will follow the process for creating the visuals, adding sound, and how to use various tricks and shortcuts to do things like reduce processor load in order to improve the game play. 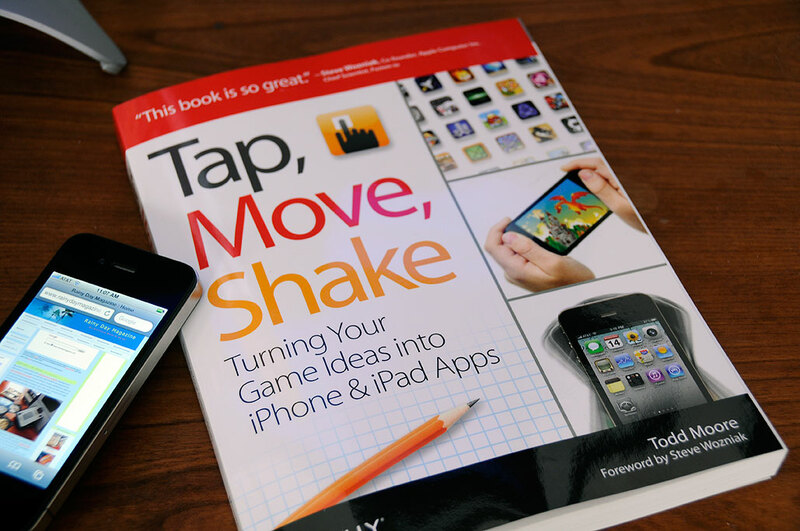 Tap, Move, Shake is an invaluable read for anyone really interested in iPhone game deveopment. 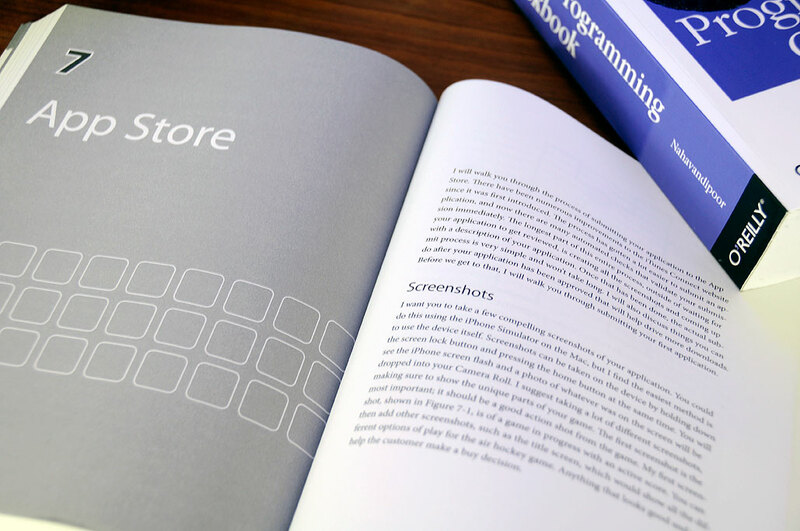 We know we said this book was not an intro to programming, but reading the beginning of each chapter would be of value to anyone who may be toying with the idea of game programming as a career. Many of the newer O’Reilly publications are also available in electronic format. The great thing about the electronic version is that they don’t take up any room on your bookcases. While we like electronic books, our preference today is still for a hard copy. The main reason is that we tend to flip amongst multiple books when learning or looking things up. However, when e-paper gets cheap enough, we will be able to have the best of both worlds. We look forward to that day!